A wood router that can be controlled by a computer to cut various pre-programmed patterns or text etc. A CNC machine set up in a small shop. I guess that the first time that I saw a CNC machine was a few years ago in my local steel distributor's warehouse. On the face of it the thing looked simple enough, it was an oxy profile cutter beavering away at a large sheet of 3/4" steel plate cutting out different sections. I soon got aware of the advantages of using this machine compared to cutting the steel ourselves with all the extra grinding and cleaning up. 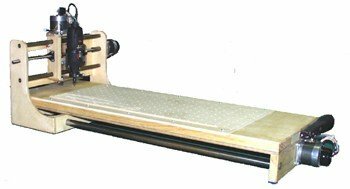 As a spin off from the development of these large industrial CNC tools we now have highly sophisticated tools available to small workshops at moderate costs. There are many people making extra income with routers like the one above. They can cut wood and plastics. They can be set up to make signs, which was their original purpose, but now with various software packages they can for example produce carvings from photos. 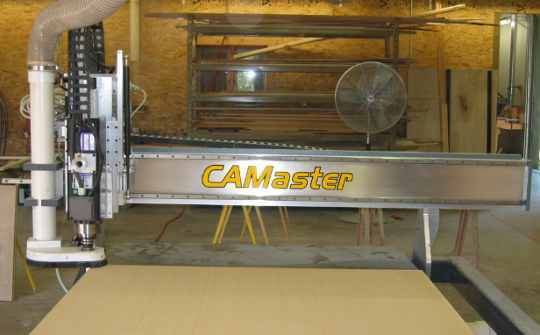 A larger CNC router machine. These machines are said to operate on three axes. In the photo above the router itself can travel along the length of the machine and at the same time it can be travelling sideways. A further dimension is the vertical travel which determines the depth of cut. All of this is controlled by software or parameters fed into the machine. The large plate steel machine that I mentioned earlier had a very simple input. A sheet of paper, say letter size, was printed with an outline of the shape to be cut. The machine would track around the outline and cut the shape to whatever scale was set.